Reviewed by Maria Conway on November 25, 2016 8:57 pm . With a striking TV ad and one of the most unforgettable advertising characters in online bingo history, Foxy Bingo is definitely one to add to your list of bingo favorites. But FoxyBingo is more than just a fun and well-established bingo brand. It has always been a big name in the online bingo industry ever since its launching in 2005. The site has even won several awards not just for excellent game play and site functionality, but also for their cutting-edge community features. FoxyBingo.com is a member of the well-known Globalcom Network and uses the the Globalcom bingo software. The site is well laid out and jam-packed with exciting goodies that will keep everyone coming back for more. It has an attractive pink, purple and cerise color scheme, complete with an unforgettable fox mascot in a suit displayed on the logo and homepage. Navigation is easy, so whether you use the navigation bar at the top of the homepage, or choose to click through one of the many appealing tabs across the page, you’re definitely going to find what you want in a breeze. The company runs a web-based application and the only thing you need is to install at least Flash version 8 in your chosen web browser. The site has plenty of generous offers and bonuses to entice you to join in, starting with their welcome bonus. Once you sign up and decide to fund your account, you will instantly get a 300% bonus on your initial deposit of £10 or more. If that’s not enough, the company promises to match every subsequent deposits between £10 and £100 with their 50% reload bonus. These offers ensure that you have plenty of cash to explore everything that the site has to offer. There’s lots of fun to keep you more than entertained. The site has a massive collection of bingo and side games for its players. The 75-ball and 90-ball bingo games are spread across 40 bingo rooms. The site has considered all aspects of a bingo player’s needs and has catered for budgets of all sizes. Ticket prices start from as low as 5p, with a maximum cost of just £1 per ticket. With a lot of rooms to choose from, you’re sure to find a ticket price to suit your bingo budget. For freebie lovers, the company offers a number of free bingo rooms where cards are free and you can win real cash. There’s the £25 pot game every half hour, and the hourly games with £50 and £100 prizes up for grabs (for funded players only). Also, there are exclusive rooms only for funded players, which means that all their hard-earned cash won’t be lining the pockets of the many bingo bonus hunters. Some of the bingo rooms at FoxyBingo.com also allow players to pre-buy tickets for the bigger games. At Foxy Bingo, players can participate in team bingo where they can play in teams of four with other site members and compete for huge jackpots in tournaments such as Foxy Races and Hide and Seek. The site also offers one of the most impressive guaranteed jackpots in the online bingo world. Every half hour, there will be a guaranteed jackpot game for you to win huge cash prizes. Guaranteed jackpots range from £50 to an eye-popping £25,000. There are also weekly pot games with prizes reaching £5,000, plus regular jackpot games with £10,000 cash prizes. The monthly guaranteed jackpot games have the biggest offer, reaching more than a staggering £1 million! Other non-cash giveaways include 5-star holidays and bingo cruise liner tickets. Foxy Bingo isn’t just about bingo. The site boasts an amazing selection of instant win games and casino games that’ll surely keep you hooked for hours! There’s a multitude of online slots with popular titles such as Fluffy Favourites and Sands of Fortune. Players will also find a whole host of popular casino games such as roulette, blackjack and video poker. You can also have a go for more traditional games such as Top Trumps, Noughts and Crosses and the ever popular scratch cards. Every room is brimming to the lid with other like-minded bingo players, and the chat hosts always provide plenty of fun for everyone. They always come up with unique and exciting chat games to add even more flair to your bingo experience. The chat game prizes are usually for Bingo Points which are part of the site’s loyalty program. These points can be exchanged for bingo game cards and tickets. Make sure to check out the chat game schedule found at the page so you never miss out on the fun! This site has a lot of promotional offers in store for its members. The site frequently updates their cashback offers such as giving 10% of your losses back if you lose 5 games in a row, which is a good way of taking the edge off your losing streak. Another fairly new addition to Foxy Bingo’s promos is their loyalty scheme. You can earn Bingo Points simply by playing your favorite games or by funding your account. Chat games can also earn you a hefty amount of Bingo Points. You can also earn up to 5,000 Bingo Points simply by inviting a friend to join their website. Once you reach a specific amount of points, you can then convert it into bingo cash or real cash – it’s all up to you. And the more you earn points, the faster you climb up the VIP ladder! Newcomers join as a Foxy Member and will remain so until they decide to fund their accounts for at least £50, which will then take them up a notch to become a Club Member. Once you become a Club Member and onto subsequent levels Bronze, Silver and ultimately Gold, you are automatically entitled to amazing extras such as a birthday bonus, a Christmas bonus and monthly cashback bonuses. 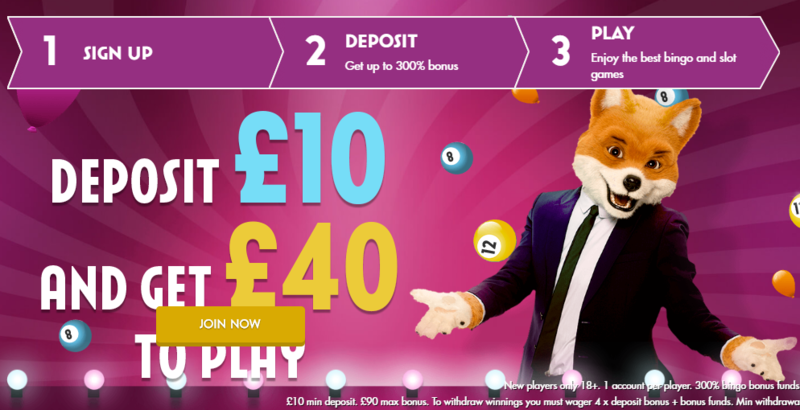 Enter the Foxy Bingo Promo Code “FOXY” to avail of unique offer from this site, while promotion lasts. Safety and security for all bingo players are this brand’s top priority. Online bingo gaming should be a fun and rewarding experience from start to finish, and knowing that your personal and account information is safe gives you peace of mind. All of the games are fully audited and extensively tested to ensure fair play and honest payouts. All private information such as your credit card number and personal details are encrypted and protected with the latest encryption software in the industry. FoxyBingo is owned and operated by Cashcade Ltd., and is legally licensed and regulated to provide remote gambling services by the Government of Gibraltar.